Here is an interesting graphic comparing beer prices for all 32 major league stadiums. My hometown Cardinals charge the second highest price per ounce, right behind the woeful Red Sox. If one were to plot teams' current winning percentages against their beer prices, one would see a weak positive relationship. Further, if the Red Sox are excluded as an outlier on the grounds that their high prices are largely driven up by the in-game beer demand of their multi-millionaire players, the relationship would be statistically significant. 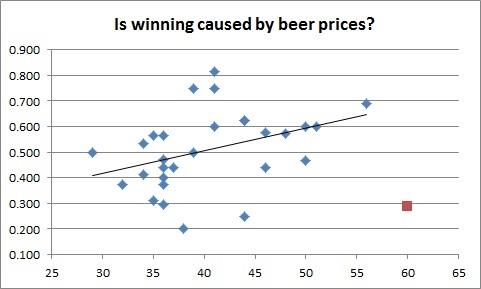 This is apparent from the chart below, which plots the teams' current winning percentages against their beer prices per ounce (the red square is the Red Sox). They say that correlation is not causation, but how about this: high beer prices lead to sober fans, which leads to better suggestions from fans to the players ("Catch the ball you bum!" instead of "Ctsch da pall yabum! "), which leads to a better team. According to my results, if the Angels raised their beer prices from 32 cents per ounce to that of the Cardinals (56 cents per ounce), their winning percentage would be 0.585 and they would be in second place in their division. Instead, they spent $255 million on Albert Pujols and his .246 batting average and 4 RBIs and are languishing in last place.